British citizens who think their European Health Insurance Card will be enough to ensure they receive all the medical treatment they could need while abroad in Europe could be travelling under a “misapprehension”, GoCompare Travel has said, citing results of a survey it carried out and has just published. In spite of this, it found that 27% of Brits surveyed who had travelled abroad “admitted they didn’t always have travel insurance cover, and 6% said they never did”. Under the EHIC, EU citizens are theoretically entitled to free healthcare in whichever European country they happen to be in, but, GoCompare Travel is warning, too many British citizens are assuming it covers much more than it actually does – putting them at risk of getting stuck with “a mountain of medical bills”. Citing the findings of its survey, which was carried out online last May among some, 2,005 randomly-chosen British adults, GoCompare says some 69% of UK holidaymakers “wrongly expect an EHIC to provide free emergency medical treatment in Europe, and 7% expect it to pay for an air ambulance to fly them back to the UK”. That at least some Brits are taking out travel insurance – and making claims on it – is evident in figures from the Association of British Insurers (ABI), which reported that in 2016, UK insurers paid out £1m a day to travel insurance policyholders, with claims for medical costs totalling £199m, GoCompare Travel pointed out. “Around 480,000 travellers made claims for medical expenses, with the average payout around £1,300,” the ABI data also showed, according to GoCompare Travel. GoCompare Travel cited an example of a British citizen who, while skiing in France, was accidentally “hit by a snowboard” and paid out of his own pocket a helicopter bill totalling £5,425. Another skiing accident victim, also in France, was “airlifted off [a] mountain to the resort clinic and later transferred to a bigger hospital”, for a total fee of £8,978, it noted. The organisation called for British travellers to be better educated about what the EHIC is able to provide – and isn’t. For example, “the EHIC is not accepted in Turkey as it is not a member of the EU or the EEA”, it notes, and it doesn’t cover “the cost of being brought down a mountain by a mountain rescue team or helicopter”, nor “the cost of being flown home under medical supervision from any destination”. What’s more, GoCompare Travel notes, the provision of state care varies from country to country, and unlike the NHS in the UK, “few EU countries pay the full cost of medical treatment”. “For example, in France , a patient may be expected to pay for a consultation with a doctor but will have up to 70% of the cost reimbursed later,” it notes. “The patient may also be expected to contribute to the cost of staying in a hospital overnight. “There are also no guarantees that you will be taken to a state hospital for emergency treatment, and many of the smaller hospitals and clinics found in ski resorts are private. Also possibly not widely known is the fact that Jersey, Guernsey and the Isle of Man don’t participate in the EHIC scheme, and therefore British citizens and European visitors don’t receive treatment in these jurisdictions, nor are their residents eligible for EHICs. GoCompare head of consumer affairs Georgie Frost said that while “there’s no doubt i[the EHIC] is a ‘must have’ for any holiday in Europe, it’s no substitute for having travel insurance with a good level of medical expenses cover, and appropriate winter sports protection included”. 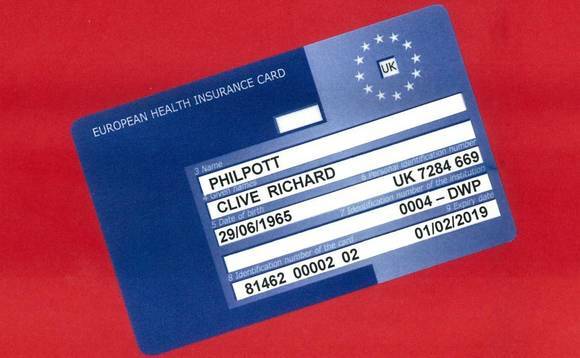 It is widely thought that the UK’s imminent departure from the European Union (currently set for March 2019) could mean an end to the ability of British citizens to enjoy the reciprocal healthcare benefits of the EHIC, and vice-versa, although nothing has yet been officially decided. For this reason, some health insurers have begun preparing products for the market – just in case. Last June, for example, Allianz Worldwide Care, the Allianz insurance group’s international health insurance company, unveiled a new, “flexible” international health insurance plan it said was aimed at small businesses in the UK that employ “inpats”, and/or have a need to send their UK employees abroad, and which it said would be “well suited” to the market if the EHIC ceases to be an option for Brits travelling to Europe or Europeans coming to the UK. GoCompare offers a guide to the EHIC on its website, which may be viewed by clicking here. An explanation of the EHIC may also be found on the website of the NHS, by clicking here. GoCompare is a UK-based, Financial Conduct Authority-regulated comparison website that enables people to compare the costs and features of a range of insurance policies, financial products and energy tariffs.